Al-Majid is now in U.S. custody. Increased security in Iraq after the U.N. bombing. The U.S. military believes two terrorist groups may be linking in Iraq. Ali Hassan al-Majid, known as 'Chemical Ali,' is in U.S. custody. U.S. orders Iraqi who survived a gas attack back to Iraq. Tuesday's bombing continues stepped-up attacks on facilities in Iraq. BAGHDAD, Iraq (CNN) -- Ali Hassan al-Majid, known as "Chemical Ali," a cousin of Saddam Hussein and the man thought to have ordered the 1988 chemical attack on Kurds, is in U.S. custody, the U.S. military said Thursday. Most accounts of the massacre estimate more than 5,000 Kurds died in the attack. Al-Majid was taken into custody several days ago, the military said. The circumstances of his capture were not immediately available. Authorities tracking down leads into the bombing think remnants of Saddam's regime, foreign terrorists or the al Qaeda-linked Ansar al-Islam could have been responsible. While there has been no confirmed claim of responsibility, Al Arabiya, the Arabic-language TV channel, said it received a claim of responsibility from a group calling itself the "Armed Vanguards of the Second Mohammed Army." The report said the "statement promised to make war on all foreigners and do similar acts." U.S. officials hunting for weapons of mass destruction, a key pretext for the war against Iraq, hope "Chemical Ali" will provide information about them. So far, nearly four months after President Bush announced the end of the major phase of the war, such weaponry the Bush administration claims was harbored by Saddam has not been found. Al-Majid was the king of spades in the deck of cards issued by the military and No. 5 on the list of the 55 most-wanted Iraqis. He served as a general, presidential adviser, a member of Saddam's inner circle, commander of the Baath Party Regional Command, member of the Revolutionary Command Council, and head of the Central Workers Bureau. In April, coalition officials believed al-Majid was killed in an airstrike on his house, but they later had to retract the claim. 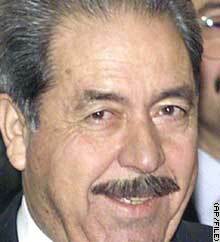 He later was thought to have been in hiding in northern Iraq, possibly in Tikrit, home of his clan. Powell and U.N. Secretary-General Kofi Annan spoke to reporters after a meeting Thursday morning in New York. "We will be working with the United Nations representatives in Baghdad on security matters," Powell said. "We want the humanitarian workers and other workers in Iraq -- reconstruction workers and others -- to have a safe environment." Powell noted the international presence in Iraq consisting of about 30 nations contributing 22,000 troops under coalition control. Five other nations are in the process of sending troops and 14 other nations are in conversations with the coalition on troop contributions. "Perhaps additional language and a new resolution might encourage others," Powell said. "There is a willingness to come together to help the Iraqi people." U.S. defense officials said Thursday there was no immediate need to boost U.S. troop levels in Iraq. "Boots per square inch is not the issue. You have to have solid intelligence in a conflict such as this, so you can get to the terrorists," said Gen. John Abizaid, head of U.S. Central Command. • U.S. troops Thursday demolished an unstable corner of the damaged portion of the U.N. headquarters in Baghdad. A single charge was detonated to bring down an area that could not withstand further activity from searchers and investigators, the U.S. military told CNN. There is the possibility that human remains are still in the devastated hulk. Two people were still unaccounted for. • A security threat prompted U.S. military officials Thursday to evacuate the Baghdad convention center, which holds coalition offices and a media center. The building has been evacuated because of similar threats at least twice before. • Central Command said an American soldier was killed and two others were wounded late Wednesday night by an improvised explosive device in Baghdad's Karkah district. All were with the 1st Armored Division. CNN correspondents Rym Brahimi and Barbara Starr contributed to this report.